﻿ Strength in Numbers: Can “Girl Power” Save Us From the Financial Crisis? Strength in Numbers: Can “Girl Power” Save Us From the Financial Crisis? However, I fear this approach will fall on deaf ears, particularly in the United States. World Population Day usually fails to get much U.S. media attention—partly due to its unfortunate timing in the beginning of vacation season—and this year was no exception. One of the few U.S.-based outlets to mention it at all was the Huffington Post. Contributor and Nike Foundation President Maria Eitel posted some comments on the economic “girl effect” from her colleague Lisa MacCallum, who says that education has “just about everything” to do with population. Also in HuffPo, CEDPA President Carol Peasley asks the population community to “forge a new consensus” that “improved family planning services enhances development, reduces poverty and reduces environmental stress,” citing the new book The Means of Reproduction, which author Michelle Goldberg recently discussed with Carol Peasley at the Wilson Center. This year is a banner one for the population community: the 15th anniversary of the International Conference on Population and Development (ICPD) in Cairo, and the 40th anniversary of UNFPA. But according to UNFPA and the World Bank, the financial crisis threatens to reverse some of the gains since the landmark 1994 Cairo conference. 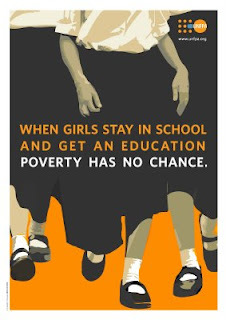 And despite the valiant efforts of UNFPA and others to promote family planning and girls’ education as a key solution, I doubt that the world’s (mostly male) leaders will prioritize girls in the midst of this economic mess. However, there is still little push to position population and its links to health and education as a key global issue. Part of the problem may be that the people at USAID and State that would push it are not yet in position; so far, only the assistant secretary for the Bureau of Population, Refugees, and Migration has been confirmed.